1.Heat the oil in a frying pan and fry the meatballs for 12 minutes, turning occasionally until cooked through with no pink meat. 2. Meanwhile, griddle the pittas for 1-2 minutes each side and split open, then fill with lettuce. 3. 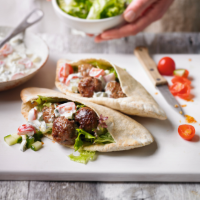 Mix together the tomatoes, cucumber and tzatziki, toss in the meatballs and use to fill the pittas. Serve. This recipe was first published in Tue Aug 05 13:26:00 BST 2014.